– Like to get more than one URL into Twitter? – Wonder how many places to list on your email signature? – Need to decide what to list on your business card? – Need to make a change and update 25 different places? 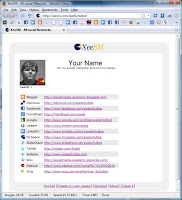 In XeeSM you have all your most current social networks, blog, communities. Such as LinkedIn, Twitter, Facebook, YouTube, SlideShare, Blog, Website, Wiki… And if you have to change something, you do it one time in XeeSM and don’t need to update all the other places.